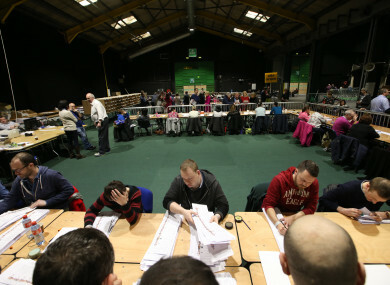 Scenes from the RDS count centre from the last election. TAOISEACH LEO VARADKAR and Fianna Fáil leader Michéal Martin have been butting heads in the last few days as the spectre of a potential general election looms over the country. The confidence and supply agreement between Fine Gael and Fianna Fáil runs until the Budget next October. At the end of last year, Leo Varadkar said he saw no reason why it could not be extended. The deal means Fianna Fáil will support Fine Gael in Government on core votes in return for a number of concessions. However, there has been speculation around Leinster House in the coming days that the agreement will not be renewed, effectively sparking an election. So this morning we want to know: Do you want a general election this year? Email “Poll: Do you want a general election this year?”. Feedback on “Poll: Do you want a general election this year?”.